Staff Photo by Robin Rudd / A view of downtown Chattanooga is seen from the Tower atop the Electric Power Building at the corner of Martin Luther King Blvd. and Market Street. Some of the landmarks include, the James Buidling, the Chattanooga Bank Buidling, First Tennessee, and Sun Trust. This story was updated Sept. 18, 2018, at 7:34 p.m. with more information. 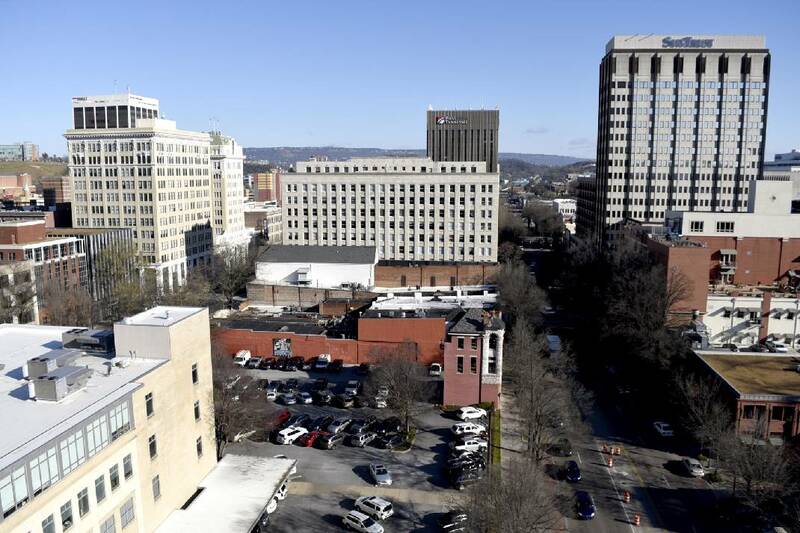 Chattanooga had the sixth fastest growth in median household income last year among the nation's 382 metropolitan areas as the local 6-county area continued to boost employment at more than twice the U.S. rate, according to a new government report released Tuesday. Median household income in the Chattanooga area topped $50,000 for the first time in 2017, rising 8 percent in 2017 to $50,250. Most of those gains came from more people working last year when local employers added more than 10,000 jobs, boosting employment from December 2016 to December 2017 by nearly 4.3 percent in metro Chattanooga, according to the U.S. Bureau of Labor Statistics. "Employment growth in the Chattanooga and Cleveland area has really been excellent, often even outpacing Nashville's booming growth, with all of the growth in the area from Volkswagen, Wacker, Amazon and other major employers that continue to expand," said Dr. Bill Fox, director of the Center for Business and Economic Research at the University of Tennessee. "As more people are working and the labor market tightens that creates more income and tends to push up wages." Median household incomes for most Mid-South cities was still below the U.S. average in 2017 of $60,336. Source: U.S. Bureau of Census, 2017 estimates. The typical Chattanooga household still earned less than 82 percent of the U.S. median income of $61,372 last year and Chattanooga's household income averaged the least of Tennessee's four biggest metro cities. But local incomes grew faster than both the state and U.S. averages, according to census bureau data released Tuesday. The total value of all goods and products produced in Chattanooga last year also outpaced the nation as a whole in 2017. In a separate report, the U.S. Bureau of Economic Analysis estimated Tuesday that Chattanooga's gross domestic product grew by 3 percent last year to more than $27 billion, making Chattanooga the 100th biggest metro area for the size of its economy in the United States. Nationwide, the GDP grew 2.1 percent, BEA figures show. "This latest round of data confirms what we have been seeing for a long time: our investments are paying off by creating a growing economy that is built for the future," Chattanooga Mayor Andy Berke said Tuesday. "Wages are critical for quality of life, and because we have one of the highest wage growths in the country, more families in Chattanooga now have a better chance of leading the kind lives that they want." Charles Wood, vice president of economic development for the Chattanooga Area Chamber of Commerce, said the economic and income gains reflect years of investments in preparing sites, workers and infrastructure to facilitate both new and existing business growth in the region. "Investments in Enterprise South, the gig infrastructure and the community's entrepreneurial ecosystem are starting to pay big dividends for the region," Wood said. "While this success is phenomenal, our median household income is still behind the other large metros in the state so there is certainly more work to do." Across Tennessee, median household income increased 5.8 percent in 2017 to $51,340 – the fastest growing median household income in the Southeast and the fifth fastest growing in the United States. "Not only are we bringing more jobs to Tennessee, we are bringing higher-paying jobs and that is great news for families across the state," Gov. Bill Haslam said in a statement Tuesday.. "As we've worked to create an environment where businesses can thrive, incomes have increased, making Tennessee an even better place to live, work and raise a family." Across the Mid-South region, median household income was above the U.S. average in Atlanta, Nashville and Huntsville, Alabama. The Nashville-Davidson-Murfreesboro-Franklin Tennessee metro area had a solid 6.5 percent growth in household income to $63,939, making it the 12th fastest growing metropolitan area in median household income in the U.S. But most other metro areas in the region had incomes below the U.S. average. In Dalton, Georgia, the median household income last year was nearly a third less than the U.S. median. Nationwide, the Trump White House Council of Economic Advisors heralded last year's rise in income, and corresponding drop in poverty, as an indication of the continued strengthening of the American economy. "Income gains were apparent in every region of the country and among both high- and low-income households," the council said in a statement. "Among Hispanics, incomes rose by 3.7 percentage points and surpassed $50,000 for the first time on record. Additionally, the official poverty rates of both blacks and Hispanics fell in 2018, each reaching new series lows." But most of the income gains came from more people working — or working longer hours — rather than any big jump in wages. "We have tight labor markets but not tight enough to generate a break from the trend — to spur meaningful wage growth," Heidi Shierholz, an economist at the liberal Economic Policy Institute, said in a report last week. Andy Sher contributed to this story.